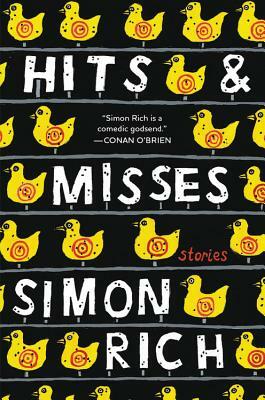 In Hits and Misses, the trappings of fame and fortune are skewered in 18 hilarious stories. Paul Revere’s horse gives us the true story behind that famous ride. A former musician with one hit song rebels against domesticity. Adolf Hitler is interviewed for a fawning GQ article. An ascetic monk sets himself apart from other monks by denying himself in increasingly outrageous ways. The author, a writer for The New Yorker, Saturday Night Live and The Simpsons, is a master of pointed observation and comic phrasing. This book will, quite simply, make you smile! A hilarious collection inspired by a former Saturday Night Live writer's real experiences in Hollywood, chronicling the absurdity of fame and the humanity of failure in a world dominated by social media influencers and reality TV stars. Simon Rich is "one of the funniest writers in America" (Daily Beast)--a humorist who draws comparisons to Douglas Adams (New York Times Book Review) and James Thurber and P.G. Wodehouse (The Guardian). With Hits and Misses, he's back with a hilarious new collection of stories about dreaming big and falling flat, about ordinary people desperate for stardom and the stars who are bored by having it all. Inspired by Rich's real experiences in Hollywood, Hits and Misses chronicles all the absurdity of fame and success alongside the heartbreaking humanity of failure. From a bitter tell-all by the horse Paul Revere rode to greatness to a gushing magazine profile of everyone's favorite World War II dictator, these stories roam across time and space to skewer our obsession with making it big--from the days of ancient Babylon to the age of TMZ. Simon Rich has written for "Saturday Night Live," Pixar and "The Simpsons." He is the creator and showrunner of "Man Seeking Woman" (FXX) and "Miracle Workers" (TBS), which he based on his books. His other collections include Spoiled Brats and Ant Farm. He is a frequent contributor to The New Yorker.